Forever CardioHealth® with CoQ10 is a special formula designed to mix with our Forever Aloe Vera Gel™ to provide three important nutritional supports for cardiovascular health. It supports healthy homocysteine levels, supplies co-enzyme Q10 to promote efficient metabolism, and provides heart-healthy antioxidants. Simply pour, stir and drink – it’s that easy – and your heart will thank you! CoQ10 is an enzyme that is produced by the human body and is necessary for the basic functioning of cells, including those of the heart and blood vessels. CoQ10 levels are reported to decrease with age, which is just when we need them most. 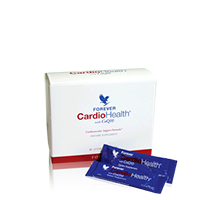 Forever CardioHealth® with CoQ10 provides the extra supply of CoQ10 your body needs. Another way Forever CardioHealth® supports good cardiovascular function is by helping to maintain healthy homocysteine levels in the blood. The B vitamins in Forever CardioHealth® (Vitamin B6, B12, and Folic Acid) have been shown to help keep homocysteine levels in the healthy lower range. This in turn helps support healthy heart and blood vessel function. Forever CardioHealth® also contains a selection of herbal extracts (Grape Seed, Turmeric, Boswellia, and Olive Leaf) found in studies to be beneficial for cardiovascular support. To all of the above we have added the heart-healthy minerals magnesium and chromium plus lecithin, known for its blood vessel lubricating and fat-mobilizing properties, and the powerful antioxidant vitamins C and E.
Now take all this greatness and mix it into your next glass of Forever Aloe Vera Gel™ for the added benefits found in the miraculous aloe leaf. Just pour, stir, and drink – your heart will thank you!